Thousands of professionals make up NFPA's Electrical Section. Electrical Section membership tailors your NFPA benefits to the industry and puts you in direct contact with experts in electrical engineering, risk management, inspection and contracting. You'll get time- and money-saving solutions to your organization's most pressing compliance issues, and you can help your company prevent unnecessary project delays and costly mistakes because you'll be able to solve potential problems in the planning stages. 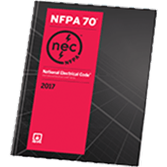 Plus, the Electrical Section gives you streamlined access to NFPA 70, National Electrical Code®. Other: Performing electrical or fire alarm services above or teaching others to perform these services. Membership is also open to any individual member of NFPA not meeting the above qualifications, provided the applicant satisfies the requirement of membership on any NEC code-making panel or NFAC committees as judged by the Section´s Executive Board. The section’s Executive Secretary keeps a record of the membership, notifies its members of section meetings and nominees for section office, and keeps members of the section informed on matters of interest. At the annual section meeting, the Chair reports on the work of the committee and may also take other steps to keep the section informed. Stay up-to-date with what's happening with the Electrical Section and participate in discussions by visiting NFPA's Xchange community (login required). In 1948, the NFPA Board of Directors authorized an Electrical Section of NFPA. The section provides particular opportunity for section members to become informed and to contribute to the development of NFPA electrical and fire alarm standards. For this purpose, it sponsors open meetings where proposals for revisions or additions to these standards may be discussed. Activities, programs, and procedures of the NFPA Electrical Section shall be in accordance with the Regulations Governing NFPA Sections. 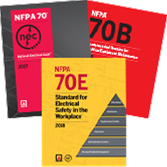 Safeguard against electrical hazards and Save with the updated NEC®, NFPA 70E®, and NFPA 70B Set.